Orange Blossoms. Strawberries. Green Monday. Economic Danger Zone. It’s all happening right now. The dog doesn’t seem to pay much attention to any of it, which serves as a good reminder not to get carried away with all the doom and gloom. Having said that, at times like this, paranoia often creeps in and a part of me does wonder if one day we will all end up going back to our roots; living in the countryside growing fruits and vegetables and making jam. 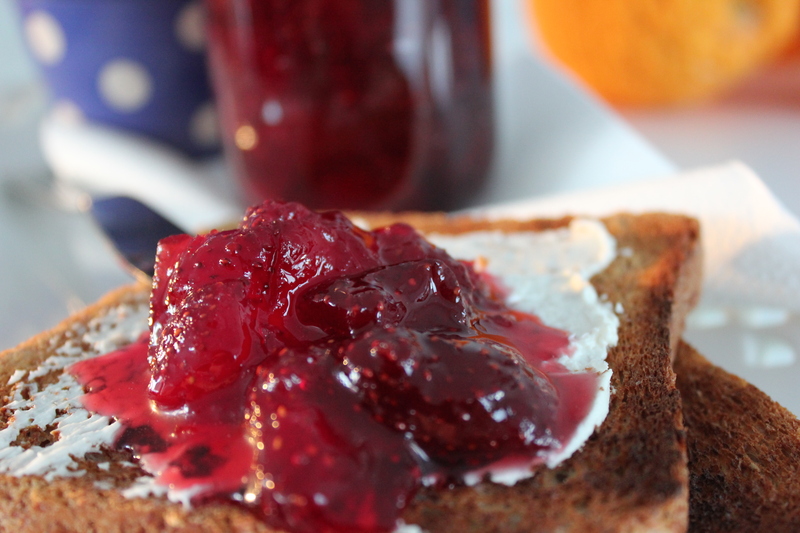 Sweet, chunky, sticky, bright ruby red jam, which is exactly what I made this week. It’s always a shame throwing away fruit that goes bad, I hate doing it. It is as though there is a right-amount-of-groceries-gene which some people (me) lack. Anyway, I had a bunch of strawberries that looked like they might turn to mush and decided they were perfect jam material, but if only I knew how to make jam. Enter: internet and a yummy-sounding but simple recipe for the jam-newbie…ta-da, it was not as frightening as I thought. The jam came out deliciously well. I paired it with some toast and cream cheese and munched away while following the economic news on the internet. 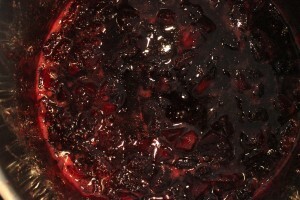 Cyprus-economic-crisis-ruby-tuesday-strawberry jam. Preparation Time: about 2 hours. Cooking Time: about 40 minutes until the jam set, but cooking times will vary. Makes about 2 jam jars. 1. Rinse the strawberries. 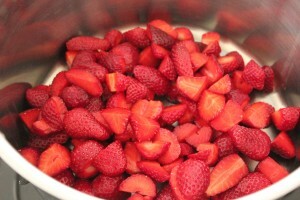 Drain and hull the strawberries, and cut them into small pieces and place them into a large pot. 2. Toss the strawberries with the sugar and liqueuer. 3. 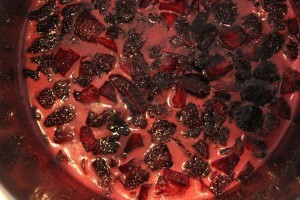 Bring the berry mixture to a boil over medium-high heat. Stir the mixture often. Add the apple, lemon and orange rind and continue to stir the mixture as it boils. You will notice that the mixture will produce a pink-coloured foam. Remove this foam with a spoon. The foam isn’t bad, but the jam will last longer if you remove the foam. 4. Continue to boil and stir the mixture until it reaches 105C on a candy thermometer, which is the setting point of jam. This should take about 30 to 40 minutes. If you don’t have a candy thermometer, then after about 30 minutes use the “saucer test” to see if the jam has set. Take a plate that has been chilled in the freezer or fridge (I used the back of a glass container that was already in the freezer), and drop a little dab of the jam onto the plate. After a minute, touch the top of the drop with your finger. If the jam does not stick to your finger, it has reached its setting point and should be removed from heat. If the jam sticks to your finger, continue to boil and stir the mixture, testing it every two minutes until it passes the “saucer test”. Note that strawberries are low in pectin (pectin helps jam to become thick) which is why apples, lemon and orange rind are added to the recipe. These are high in pectin and help the jam set. 5. 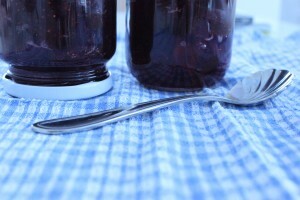 Once the jam has reached its setting point, take the jam off the heat and let it cool in the pot for about 15 minutes. If the jam has any remaining foam, remove it at this stage. 6. If you wish to store the jam in jars in the fridge for over two weeks, then you will need sterilized jars and a sterilized spoon to scoop the jam into the jars. To sterilize a jar and/or spoon, wash it with soapy water. Then place the spoon, the jar and lid (open side up) on a tray and place it in the oven at 80C for 25 minutes. When removing the jar, do not touch the inside of the lid or jar. When removing the spoon, do not touch the part of the spoon that will be scooping the jam. 7. Scoop the jam with the spoon into the jars. Make sure to fill the jars to the top. Tightly seal the jars as soon as the jam has been added. Place into the fridge and let cool for at least two hours.